Jack lives in St. Thomas but on the first Thursday of the month you can see him carving one of his pieces downstairs in The Mary Webb Centre Gallery. 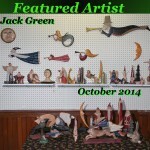 Jack’s work consists of small hand-carved one of a kind folk art figures that he then paints in soft faded colours. His favourite woods are basswood and pine.